Ready to tackle some jobs on the great outdoors? Looking for versatile garden tools saw with powerful performance attributes? This tool is TESTED RIGOROUSLY, pruning and trimming branches with ease! The power is on your hands...let me tell you. 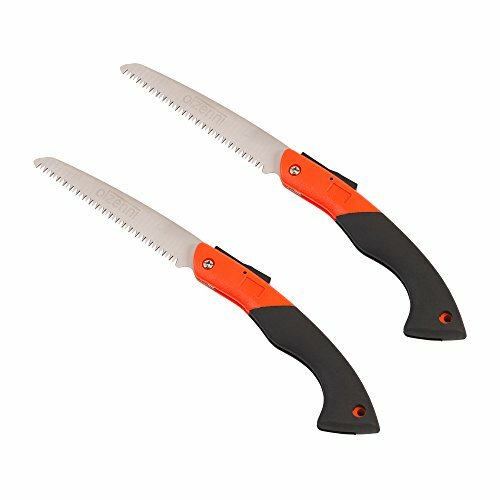 Safety first; this long handled pruning saw locks in 3 positions. Locks when fully opened to do the job, and safely locks at the half-way mark as you are closing the blade so it will not accidentally snap your fingers. Lastly, locks on close position for storage. Do you drive 4WD? Cutting dry woods with this tool's long curved TPR rubber handle, it's just good, smooth and feels you are more in control. Yes! Your package will include 2x pull-cut hand saw. One for you and your partner, or maybe little budding gardener. Whether just trimming tree branches or hauling the family for camping trips, this tool suits the job. If you have any questions about this product by Olzenni, contact us by completing and submitting the form below. If you are looking for a specif part number, please include it with your message.